I'm all about efficiency in the kitchen; how to create a dish that can double as multiple meals. 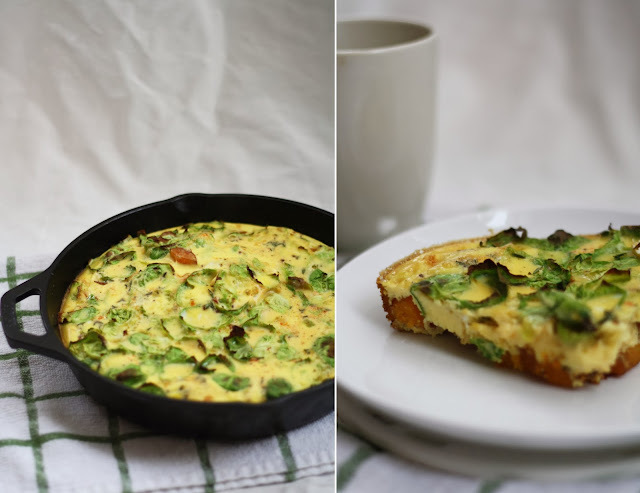 Meet the frittata - the perfect Sunday breakfast, and Monday (or midweek) work lunch. Frittatas are so simple to make, and you can never really go wrong when pairing your veggies and herbs. If I'm making one that I anticipate eating for lunch as well, I'll be sure to add a substantial starch - like sweet potato, squash or grains. An additional sprinkling of goat cheese is never a bad thing either. As for the herbs and spices, toss in whatever you have lingering in the fridge or on the pantry shelf. I promise you, almost every combination will taste delicious, so let loose and get creative! Note: I had pre-cooked the butternut squash the day before to save time. Simply chop the squash into small cubes, season with olive oil, balsamic, salt and pepper, and roast in a 400 degree oven for roughly 30 minutes. In a small bowl, whisk the eggs, milk, thyme, salt and pepper. Set aside. In a cast iron skillet on medium heat, reheat the squash with a drizzle of olive oil. Be sure to keep the squash in a single layer lining the bottom of the pan. After a few minutes, sprinkle the smoked paprika and brussels sprout leaves over the squash. Cook for about 3 minutes - do not stir. Remove the pan from the heat, pour the egg mixture on top and transfer into the preheated oven. 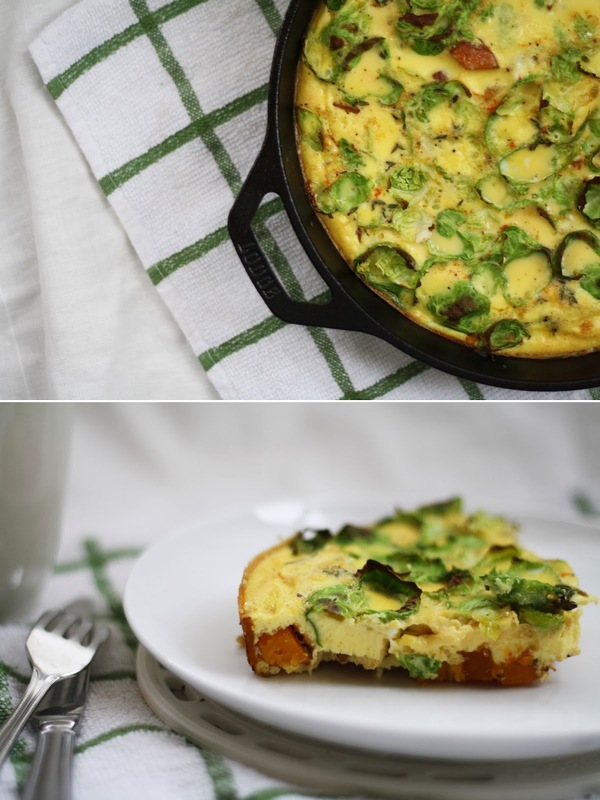 Bake for 12-15 minutes, until eggs are just set. Broil for 2 minutes to crisp up the brussels sprout leaves. Serve with a drizzle of siracha hot sauce.